There are so many more ways to effectively use promotional apparel than just outfitting your booth staff. Here are some clever ideas as to how promotional apparel can be used to invite, involve and thank the prospects who you want to impress. First, let’s talk about pre-show publicity. Set your prospects’ expectations as to what/who to look for on the trade-show floor. “We’ll be dressed for success – look for our reps in bright red shirts and the XYZ logo for assistance.” Include a fabric accessory – perhaps a scarf or bandana in your corporate color – to help recipients visualize the colors to watch for at the trade show. This inexpensively adds a lumpy element to your mailer. You can even imprint the invitation on the bandana. Second, think of ways to turn attendees into walking billboards – traveling up and down the exhibit-floor aisles dressed in your corporate colors. 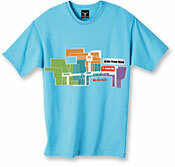 We’ve seen t-shirts designed with a map imprinted on the back directing folks to a desired destination. This concept is easily applied to a trade-show setting to illustrate your booth location via an exhibit-floor diagram. Of course, you’ve got to give attendees an incentive to wear such a t-shirt. Let them know that booth personnel will walk the aisles and award prizes hourly to anyone wearing your company shirt. Last, remember to follow through. An imprinted cap is a clever way to say, “Hats off to you for visiting our booth.” You can place requested product samples/information in the cap and send it in a colorful box to be sure your package gets past the secretary who sorts through the flood of post-show mail! These are just a few examples. With thousands of apparel options in the marketplace, we can easily suggest the best outfit for your organization to ensure success for your next trade-show promotion. Just give us a call at 708-478-8222, send us an e-mail or visit us online at www.linjen.com.